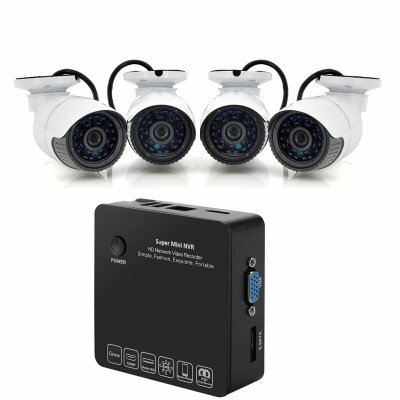 Successfully Added 4 Channel NVR Security Surveillance Kit - 4 IP Cameras, OVNIF 2, 1080p/960p/720p, E-SATA HDD Connection, Cloud P2P to your Shopping Cart. This small portable NVR box is actually a powerful security device. Unlike a DVR (Digital Video Recorder), an NVR (Network Video Recorder) doesn’t need a point-to-point connection with your security cameras, letting you keep an eye on your office or storage space from the comfort of your home. With 2 USB ports, VGA, Micro USB, HDMI, LAN, E-SATA, as well as OVNIF 2 compliance, you can easily hook up the mini box to various devices and make it part of your current security system or build up a new one from the ground up. The security kit comes with 4 high resolution IP cameras, that will process video at the site, encode and compress it and then send over to your NVR box – that can be placed anywhere within the reach of the network. You can store the received footage on the hard drive, external devices or the P2P Cloud Service. Thanks to the compressed format, the videos won’t take up too much space, while preserving HD quality. The IP cameras come with a 30 meter IR range, letting you control a large space even after it gets dark. This makes the system perfect for storage facilities, parking lots, supermarkets or similar premises with a large area to cover. The cameras come with an adjustable base, letting you chose the perfect viewing angle and keep an eye over what matters most. As an option, you can also watch the recorded footage right on your smartphone, tablet or PC, letting you get quick updates of the situation on the go. Go to the browser on your device (Firefox 4,Google Chrome or IE 6.0) to access the cloud and view all the available video content in a matter of minutes. This way, you can have the peace of mind by always staying in control of your workplace or other facility, no matter where you are. This Mini NVR Security Kit Smartphone comes with 12 months warranty. Brought to you by the leader in electronic devices as well as wholesale NVR kits, Chinavasion..